Red Eagle was born in the Sundered Hills and named for the screeching bird-call that greeted his birth, as well as the crimson blooms on the autumn hills. The augurs foresaw the boy's destiny as a warrior without peer who would unite the ten warring kingdoms of the Reach under his name. His people expanded and prospered until Hestra and her armies arrived; one by one, the kings of the Reach swore fealty or fell to her. When Red Eagle refused to yield, the scared elders cast him out. In the years that followed, the exiled Red Eagle became known as the untamed spirit of the Reach, unbowed, unbroken, stained by the blood of his foes. He gathered Reachmen who clung to the old ways and yearned for freedom to forge a new nation. They engaged in an extended guerrilla campaign which, while tactically successful, was not enough to stem the seemingly endless waves of Imperial reinforcements. Red Eagle eventually traded his heart, his will, and his humanity to the Hagravens to become a spirit of vengeance, pitiless and beyond remorse. The rebels grew in strength and numbers, and none could stand against them; after two years, they had all but succeeded in driving the foreigners out of the Reach. Hestra's generals returned with an even bigger invasion force and laid siege to Red Eagle's stronghold until he himself came forth for battle, alone and naked, and purportedly killed a thousand soldiers before they brought him down. Red Eagle was taken to a prepared tomb, and with his remaining strength, he presented his sword to his people, and swore an oath: Fight on, and when at last the Reach is free, his blade should be returned, that he might rise and lead them again. By the Fourth Era, a descendant offshoot of the Reachmen, the Forsworn, drew several parallels to the struggles of Red Eagle and his oppression under an occupying force. As such, many of them extolled his teachings and practices, and looked up to him as their savior. 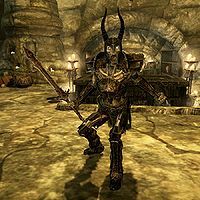 In 4E 201, the Last Dragonborn plundered Red Eagle's tomb and killed the draugr he had become, claiming his mighty sword.